About the book: The new book written by Hans-Josef Fell in June 2012 in the English language deliberately for international discussion MdB is an attempt to enrich the global climate debate with new strategies. In June 2013, the updated German version was released. makes economic sense, because climate-friendly economies today are often more profitable than the old oil industry. Hans-Josef Fell proposes new climate protection goals, new political measures and promotes the involvement of the financial sector. Worldwide experiences, especially with laws and political strategies for climate protection are discussed in detail. As a new goal, a „global cooling“ is proposed, instead of settling for the „two-degree Celsius“ and thus a further heating of the earth’s atmosphere. 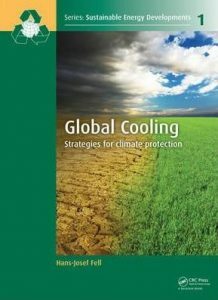 Essential building blocks for a global cooling strategy include the cessation of the use of fossil fuels in the energy, transportation, chemical, construction and agricultural sectors; as well as a carbon purification of the atmosphere. Both are feasible and already often economically advantageous. The focus is on the global changeover to 100% renewable energies and the conversion of global agriculture to sustainable, organic cultivation methods. The positive experiences of the Renewable Energies Act (EEG) introduced under red-green show that it is possible to profitably invest private capital in large quantities in climate protection. The political discussions about the EEG and other climate protection measures are presented in detail. Clean up with the fake solutions from the low carbon strategy, where the nuclear energy, CCS and intensive agriculture are still referred to as climate protection. Forewords have written: Caio Koch Weser, former Vice President of the World Bank and Prof. Dr. med. Mark Z. Jacobson, Stanford University California.